In 2011’s bestselling How To Be A Woman, Caitlin Moran discussed, well, all things female. It had a big impression on me; a year and a half on from reading it, I am no longer concerned that owning only one dress (the one I got married in, never to be worn again), one pair of heels (which I can’t really walk in), never being bothered with make-up (so many things I’d rather do with my time and money) and not wanting babies (ditto) makes me a rubbish woman. I am not a rubbish woman; I am a woman who doesn’t like stereotypical woman things, that’s all. Caitlin made me appreciate this. Caitlin also made me want to buy more things written by her, the cunning minx. So, here we are: Moranthology was released and I duly bought it (then queued for an hour and half to get it signed by her, but that’s another story). The sharper amongst you may now be thinking that Moranthology sounds like an anthology of Moran, and you would not be wrong. This book represents what is essentially Caitlin’s greatest hits collection: all her best bits (reviews, interviews and columns) compiled into one handy book with a running commentary to link all the disparate bits together. So as well as getting Moran, you also get Moran on Moran…sort of Moran². That’s an awful lot of Moran for your money, even when (like me) you have read many of these items before when they were first published in The Times and actually own some of them already in other forms (a couple of bits were in How To Be A Woman and the chapter on library closures was in The Library Book). In How To Be A Woman, we learnt just how well Caitlin Moran can write. 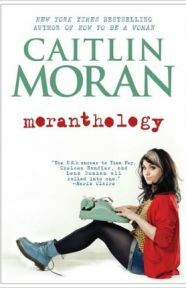 In Moranthology, we can see that Caitlin can write well about more than just lady-related things. Topics covered in this book range from the sublime (her coverage of the royal wedding) to the ridiculous (why England doesn’t have a national vegetable) via serious stuff (benefit reform and poverty) and holidays (in Ullapool and Aberystwyth – she thinks travelling abroad involves far too much faff). If you have read even a small fraction of her work before you will be familiar with many of the themes and anecdotes she uses, but the way she is able to revisit these ideas and motifs regularly and still find ways to make you laugh, make you think or win you around to her point of view makes for a very enjoyable and engaging whole. It is not many books that can make you go from cackling with laughter on one page to shaking your fist with indignation at social injustice on the next. Suffice to say that I enjoyed this book as much as the last one. Being comprised of a lot of short pieces (with frankly inspired chapter heading such as “David Cameron: Gammon Robot”, “The Gay Moon Landings” and “Hello, England’s Rose”) it has great “dip in” ability for when you only have a short window of reading time available. That said, I found it difficult to just dip in to it. It was like a pack of After Eights – I just kept on wanting “just one more”, and then…whoops, half the pack has gone, how did that happen? Mind you, I would have loved to have seen some photographs included with it. I appreciate that her columns don’t use them, but there must have once been photos to accompany her other items, and it would have been a nice touch to have them included here. This is a book that will undoubtedly have already have been snapped up by her fans, but I hope it is also one that will introduce new readers to Caitlin’s writing. I loved reading Moranthology and have no hesitation in recommending it – although admittedly this was not my most unbiased review ever.